Wild boar? In a pork pie? I know what you’re thinking. That’s got to be the most exceptional pork pie ever, right?! It’s certainly the most intriguing pork pie I’ve ever eaten, that’s for sure. This pie is the masterful creation of those wonderful people over at Nice Pie, who just don't seem content with making regular pies. Just take a look at their exotic pie range. Their kitchens must be like one crazy safari ride - "There's some buffalo. And that? That's crocodile. And here's some elk." Now, just in case you were wondering, I’ll clear up the question of whether wild boar qualifies as pork. Wild boar, or Sus scrofa, is part of the biological family Suidae, the pig family. It is the undomesticated ancestor of Sus scrofa domesticus, the domesticated pig. So yes, wild boar definitely qualifies as pork. This question was important as I ate this pie during my 24 hour challenge of eating nothing but pork pies, in celebration of British Pie Week. That aside, how does the pie rate? Was it ‘sow’ delicious, or did I quickly get ‘boar’ed of it? First things first, the colour of the pie is a nice golden brown. I ate this pie cold, like a regular pork pie, so the colour is how the pie arrived rather than after any oven cooking. This is a nice rich colour that one would associate with pork pies. Very good. Equally, the condition of the pie is great. It’s a very attractive pie, with lovely stencil work in the pastry. The pastry hasn’t crumbled or cracked at all, and the pie has held itself together well and would be a striking centrepiece to any picnic. But what untamed beasts lurk beneath the pastry? What will come stampeding out as I slice through the pastry? There’s only one way to find out. Upon slicing open the pie, I’m relieved to find that there’s no risk that the wild boar will come hurtling towards me. Instead, I find the pie is packed with pinkish wild boar meat, lined with the classic pork pie jelly. 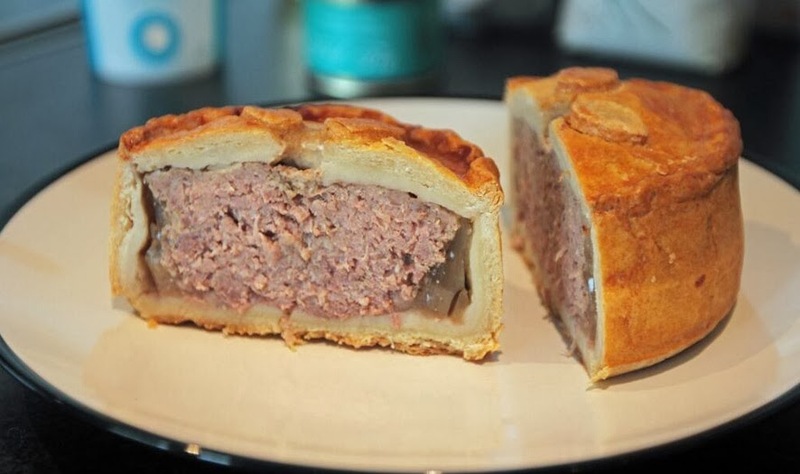 The boar meat seems to be of a different consistency to regular pork pies; it has more of a ‘minced’ appearance, and is softer. I’m not sure what other ingredients go in to the boar, but to me this looks like pretty much unadulterated meat, meat and more meat. There’s very little air gap, which is terrific. The boar itself is delicious. To me, it actually tastes quite sweet and is certainly tender. I really enjoy it for the first few slices. 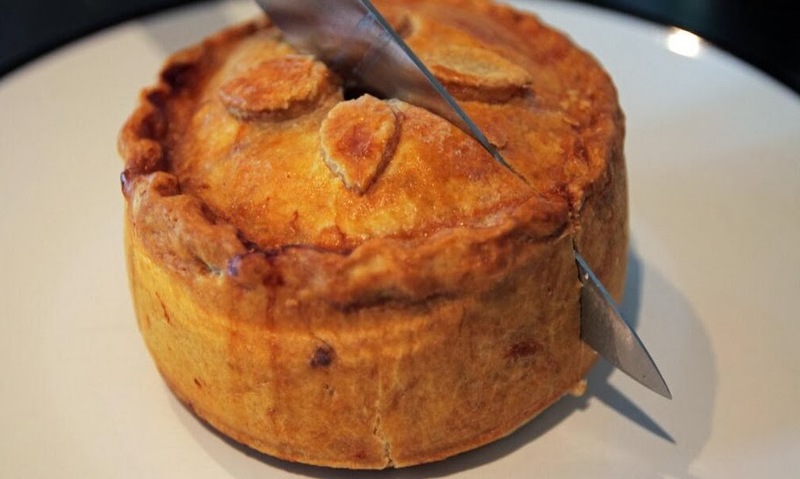 The boar is a wonderful meat, and wild boar pork pies should definitely be ‘more of a thing’! However, to really elevate this pie, I’d like to see some interesting twists with the boar – perhaps wild boar and apple pork pies? And maybe some twists with making the jelly fruity, for example. I’ve seen some pretty exciting things being done with pork pies right now, including funky layers, interesting herbs and spices, and innovation with the jelly. To get the top scores in the content category, I’d like to see more than just a filling of meat. Once I’ve eaten over a third of the pie then the taste starts to get quite sickly (remember, I’ve eaten nothing but pork pies this day, and can’t eat anything else to mix up the taste). I’m sure if you ate this pie in moderation, and with other foodstuffs such as pickle, then the richness of the pie wouldn’t be a problem. At £3.95, the cost of this pie is probably right on the money. It’s a large pie, and is dense and packed with meat. Plus it’s also definitely not your regular pie – this is wild boar, and it’s delicious! This pie would be wonderful to share, and it would transform any picnic from a standard scotch egg and crisps affair into an “Oh my goodness, my weekend was the best ever thank you, we ate wild boar in the sunshine and it was totally delicious” al fresco dining experience. I'll be bringing it along to summer parties. What did we think of squirrel pie, zebra pie and kangaroo pie?